A donut cake that will make all those box cakes in your cabinets green with envy. This cake is so good. And, it is a donut! I can’t even begin to tell you how excited I am about combining my two favorite birthday treats. A donut + A cake. 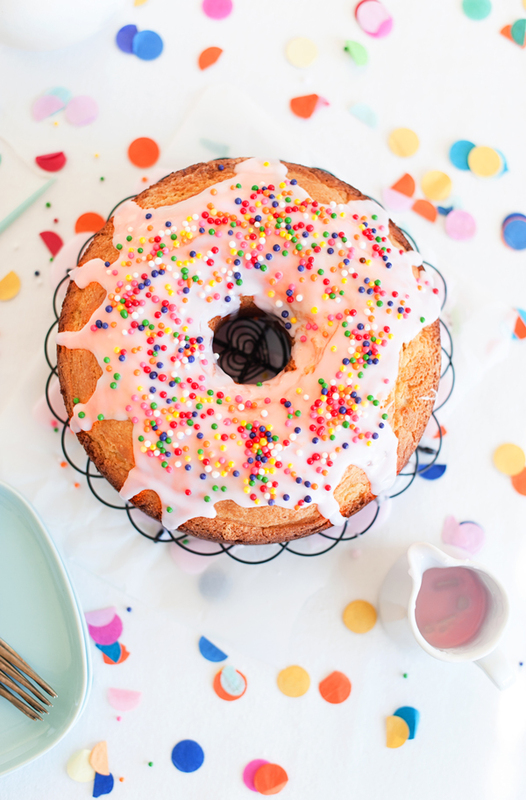 I mean, who needs anything else but this donut birthday cake recipe for celebrating a birthday with the brightest fun possible. Now… to find more birthdays I can make this for. Donuts have been around for a very long time; remember when we did this donut tree forever ago? 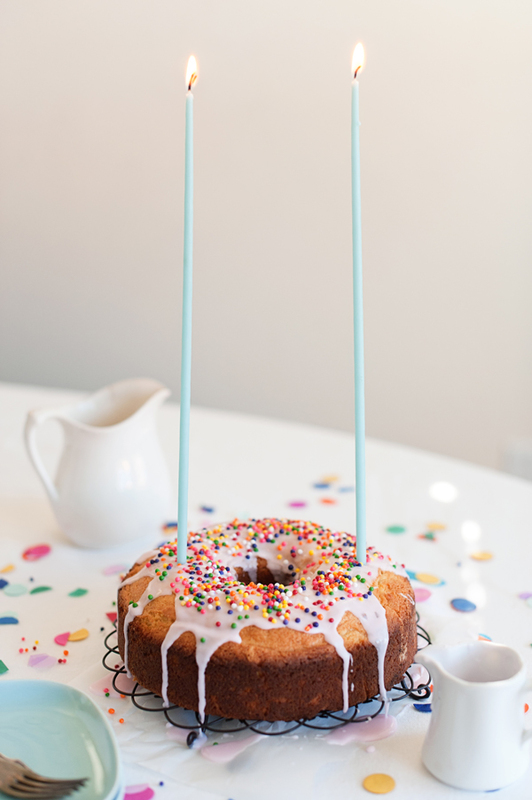 I’ve loved seeing all the new ways bloggers are creating and displaying these yummy goodies – donut cookies, donut Valentines and donut balloons – this sweet trend of making a donut birthday cake is surely sticking around. And of course, I’ve always loved the concept of a cake of doughnuts! I mean could there be anything more wonderful for celebrating a birthday? With birthday season in full-go mode this time of year, I thought it would be fun to to a variation of the donut cake for our party cake series… but instead of stacking donuts, why not just make a HUGE cake that is actually a real life donut? A donut cake in the most literal form. Yum! Making a donut cake is easier than making actual donuts I think. 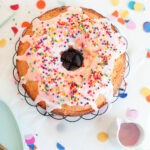 The recipe is for a cake like donut (the best kind of donut anyway!) made in large form to create full life sized donut birthday cake. 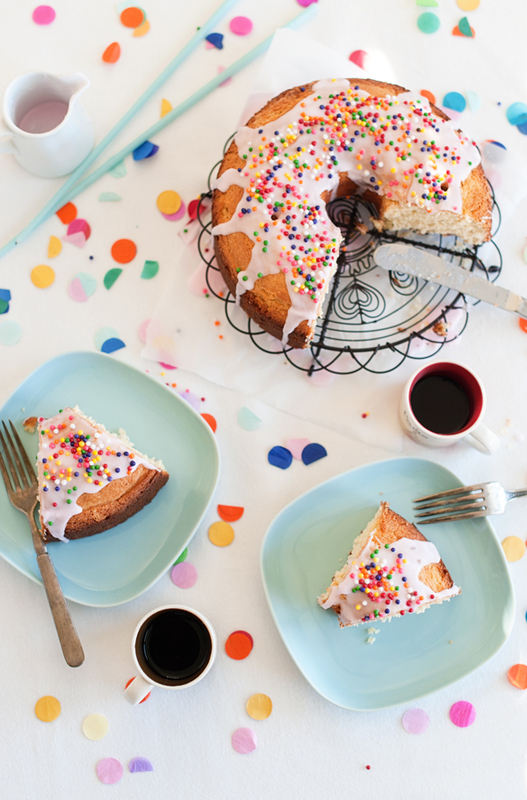 A birthday donut cake that will give anyone the sweetest way to be celebrated. 1/2 cup buttermilk at room temperature. Butter and flour a tube pan, set aside. Start by beating the butter and sugar in the bowl of a stand mixer until light and fluffy, about 2-3 minutes. Add the eggs, one at a time, and then the vanilla - beating to incorporate after each addition. Scrape down sides of bowl with a rubber spatula. Whisk together the flour, cornmeal, salt, baking powder, and nutmeg. Add the flour mixture to the batter in 3 parts, alternating with the buttermilk, starting and ending with flour. Incorporate each addition well before adding the next, but don't over-beat mixture. Spread the batter in the prepared pan and smooth the top. Bake until the top is puffed and golden brown and a toothpick inserted in the cake comes out clean, about 35 minutes. Let cool. Whisk together the powdered sugar, water, and food coloring in a bowl. Adjust consistency of the glaze, by adding a small amount of sugar if it's too watery, or adding water if looks too thick. Pour the glaze over the cake and add sprinkles, candles, or jimmies. For the sweet donut glaze you’ll follow the directions above and be sure to follow our tips on how to make donut glaze that is colorful & bright. 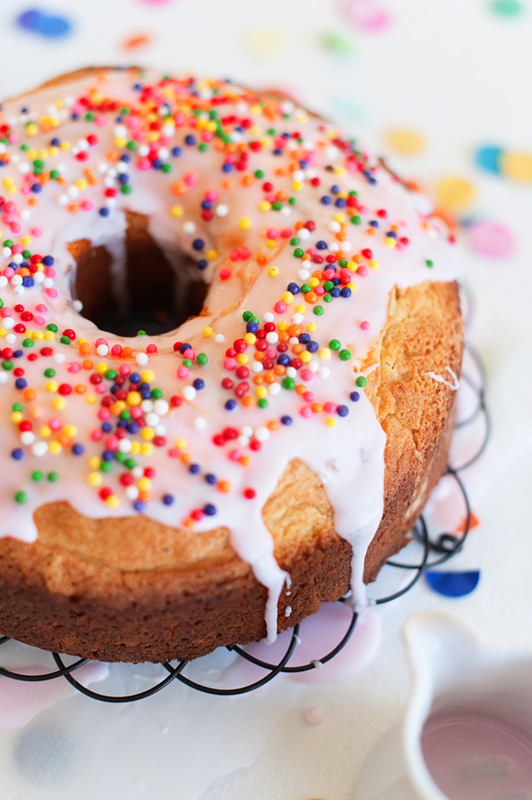 Let the donut cake cool completely before frosting for the best looking donut cake around. Pour the glaze over the cake and add sprinkles, candles, or jimmies. Enjoy a birthday treat that everyone will love! Photography and styling by Athena Plichta. Creative direction by Victoria Hudgins for A Subtle Revelry. Recipe adapted from Catherine Newman. this cake looks amazing! I seriously need to try this. This is just so, so pretty. What a great idea for a birthday cake. Thanks for sharing. I love this idea! Such a great way to turn a basic cake into a celebration! An extra large donut sounds delicious! We made this cake yesterday. It was pretty good, but we all agreed it didn’t really taste like a typical donut or a typical cake. A stick of butter is 8 Tablespoons or 4 ounces (1/4 cup). Where did you get that wire cake stand from? It is so cute!